everything was pretty great at this hostel! we just got a bad draw of people in our room for the mixed dorms. we were two 21 year old girls in a room with ALL men who were much older. we did choose that room, but just were unlucky with the people in it. however, the staff let us keep our luggage there all day in a secure luggage room with cameras in it, so that was very kind. overall, good hostel to stay in. its in the center of the city so everything is in walking distance. 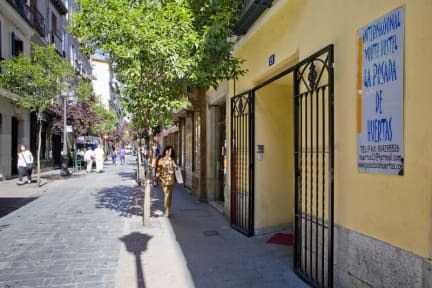 Busy hostel in a good location in central Madrid. It would be great if they could add small shelves next to the bunk beds. Bathrooms fairly clean. Absolutely recommended. A good place to stay even more than a couple of nights. Reception super-nice, good breakfast, clean rooms, really good price in central Madrid. Was a great stay. I found that i had lost my wallet and the staff was very helful and kind and also very comforting. The hostel itself is great value for money. this hostel had a great location (lots of food places and attractions within walking distance), offered free sangria, and was overall clean! the free breakfast was not very fulfilling.. just bread and jam and cereal (i guess you can't expect too much though). the staff were not very friendly - the man who checked us in was on the phone the entire time, and made an unappreciated joke about my reservation not being there. those were my only complaints - overall, i would recommend it! Perfect location! Super close walk to everything. Staff didn't mention the activities the hostel offered at check-in, so make sure you ask them about it if you're interested in participating in them (city tour, pub crawl, etc.). I felt safe, and they provided lockers that locked with your room key so that was also a plus. Nice place, well located and friendly staff. Just the bathroom was with the drain blocked. Great location, right in the heart of Madrid. Doors and lockers were secured with key-card so your things are safe. The place lacks any atmosphere, the staff are indifferent and there is no common area except the kitchen. The facilities are quite run-down, but kept clean (however the dorm smelled funny). Guests are asked to prepare their beds and then return the sheets, which was strange. Overall a good budget stay for 1 night, not a social place though.